Imagine a struggling writer standing over his kitchen sink burning page after page of handwritten manuscripts because he doesn’t want any record of “these travesties” to remain on earth. That’s what’s Donal Ryan did with seven or eight (!) novels and one hundred (!) short stories before he became Ireland’s most successful debut author with the release of The Spinning Heart in 2012. 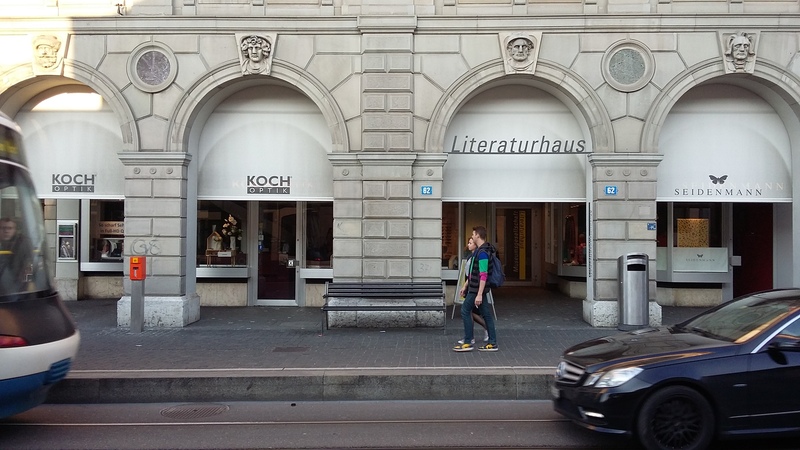 I heard this account from Ryan yesterday evening at a reading in Zurich Literaturhaus. His honesty and Tipperary accent were a tonic. In fact some of the early work that Ryan destroyed was festering in the hard drives of old computers and it was a case of delete and empty trash rather than burning. But what made him trash the old material and believe in his first published novel so much he submitted it “to every publisher in the English-speaking world”? Then, with The Thing About December, Ryan tuned in to the right station, as he put it, and found his voice. The book, written before The Spinning Heart, was published last year and tells the story of Johnsey, a vulnerable young man in rural Ireland, hopelessly ill equipped to deal with the changes life thrusts upon him after his parents die. The story is written in the close third person and Johnsey’s predicament is told in his own deceptively simple language. The writing is moving and eloquent, and funny when it’s not devastating. The story is well described in this Irish Times review. Ryan spoke about love a lot on Monday night and reading between the lines he appears to care deeply about Johnsey and what the character represents. Even his mother became fiercely protective of Johnsey and spoke of him as if he were a real person (rather endearingly, Ryan mentions his family a lot). “All stories are about love, or the absence of love. All stories are based on declensions between those two states.” Ryan repeated this idea, which seems to be his motto. I’m in the submission doldrums at the moment, that point when a writer begins to doubt their worthiness and the wisdom of committing so much time and passion to the whole enterprise. So of course I asked Ryan how he struck submission gold. He mentioned sheer luck and a scatter-gun approach but perseverance seems to have been the key. Interestingly Ryan wrote The Spinning Heart (also set in Johnsey’s village but about a decade later, and written in 21 chapters of different first person narratives) swiftly and without a struggle while he was submitting The Thing About December, to take his mind off the rejections. When he moved on to the submitting stage with The Spinning Heart he clocked up dozens of rejections. He kept print-outs of his email rejections in a folder and once, when asked by a journalist, made a rough count of forty seven, but there were more that didn’t make it into the folder, he said. Donal Ryan has a collection of short stories coming out in December, also set in the same fictional village as the novels. He describes it as the best work he’s ever done. Meanwhile, work on his third novel is progressing painfully, he admits. I left the Literaturhaus with a smile and with the feeling I was fortunate to have spent time listening to a great ambassador for Irish writing. It’s a reminder that whenever things get tough, it’s good to connect with other writers (if only from a distance) for inspiration and encouragement. I’ll be back in Zurich next month to attend a talk by Siri Hustvedt. Can’t wait! Persevere. That’s all we can do. Great piece. Thanks Niall. Tis a hard old station. That sounds so inspirational, Clare! By the way: I loved The Spinning Heart. Then you will love The Thing About December. The main character Johnsey is incredibly real and endearing. I actually think December is better, wasn’t mad about the jumping voices in The Spinning Heart, although I felt it had the best opening lines ever. This is a great blogpost, Clare. It is so competitive out there, I sometimes wonder how anyone manages to persevere and get to the publication stage down the ‘old fashioned’, ie so-called mainstream publishing route. I didn’t know Donal Ryan had had such experiences and it’s really good to hear them. Hope for all of us, eh? Don’t laugh, but I really am of the opinion now that it doesn’t matter what age you find writing success, or how many years you spend at it before you reach your goals. What is more important, is knowing you can write sufficiently well to be considered publishable by those who make such decisions. Some of us (ditto Donal Ryan) are not going to be ‘discovered’ overnight and make a killing with our debut, snapped up after a ferocious bidding war. Thanks again for another stimulating writing related post. Hi Safia, don’t know how I overlooked responding to your insightful comment. I have also come around to realising that success or no success is something that is happening on a different plane and as long as the compulsion to write is there it’s best to follow it. I know I’m more content in the rest of my life when I’m writing and a story starts to move and come alive. How nice to get your feedback Martha! I would happily be part of a cluster but don’t see one popping up in Fribourg any time soon. You are lucky in Dun L with all the good writers that come to the Mountains to the Sea festival. Glad to hear Suri H is worth the trip. My little jaunt to Zurich cost me an arm and a leg. All well with me. I’ve just written a short story about a woman with three boys and I thought of you. Have a nice week! It’s amazing how much wastage there is with writing, something Emma Darwin often writes about on her blog. It can be really hard to look at stuff you’ve put your heart into and admit it’s only fit for a bonfire. I have boxes and computer files that merit burning – maybe I’ll feel ready to do it when the actual copies of my novel arrive. Sometimes we just have to take a break from the trials of submissions and rejections and lick our wounds. You’re clearly a talented writer, Clare, and I’m sure you’ll bounce back. Your literary salon sounds great, however, I hope you can use it as a fab evening out. Thanks for the kind words Anne. I just had a chat with someone today about the problem of clutter around the house but when I think of the writing clutter on this computer! Congratulations on the cover design of your book. It really stylish and intriguing. It must be fascinating and very gratifying to see the whole publishing process unfold from the inside. Goodness knows you have put the hours in. Well done!